Following an indifferent first season at Tottenham, Mauricio Pochettino’s team have clicked into gear. A number of astute transfer decisions have created a deep squad with a number of potential options for Pochettino to utilise. Harry Kane has emerged as a genuine superstar, and Eric Dier has become a full-time defensive midfielder. But one of the key factors in their rise is Pochettino’s tactical system; this ruthless machine of a Spurs team is entirely different from the soft-centred teams of years past. Who is N’Golo Kanté and what has led to his meteoric rise in the English Premier League this season? Joining Leicester City from recently promoted Caen in France, Kanté joins the list of relatively unknown imports who have made immediate impact at their respective clubs. In a riveting clash between title contenders Arsenal and Leicester City, Kanté emerged as one of the top performers. He was everywhere; plugging up holes, initiating attacks, making key interceptions and even dribbling in pressure situations. 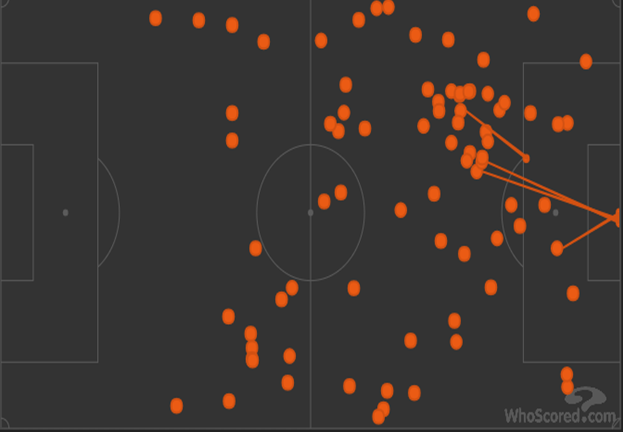 But this doesn’t fully capture the subtleties of Kanté’s game, which allow him to produce what he does. Alongside Daniel Sturridge, Coutinho’s signing in the January window of 2012/13 invigorated a previously stagnant Liverpool attack. He continued to blossom and played a pivotal role in Liverpool’s assault on the top of the table in 2013/14. But despite signing as a tricky playmaker, Coutinho has now morphed into a shot monster. He is well in front of any Premier League player in long-range shots, and also ranks 1st in Europe’s top five leagues for 2015/16. Most of Coutinho’s basic stats exhibit a steady trend. That in itself is important to recognise, but more so is understanding why he’s grown in that way. For the first time in half a decade, Inter Milan are involved in a genuine fight to win Serie A. With Juventus’ struggles in the early parts of this season, it has opened the door to a four-team battle for the title. Napoli have been arguably the most consistent team in Serie A, Juventus has clawed their way back to contention and Inter already have victories over title contenders Roma, and Milan. Roberto Mancini overhauled their squad during the Summer transfer window, and remodeled an attack that was previously based around striker Mauro Icardi. The Argentine had tied Luca Toni for first in goal scoring in Serie A at 22 goals. Adam Ljajic and Stevan Jovetic were captured on loan deals, with big money spent on Ivan Perisic and Geoffrey Kondogbia. Mateo Kovacic was the only main departure. On the aggregate, Inter Milan’s attack has been acceptable, especially considering the upheaval at hand. Inter rank 8th in Serie A in total shots, 6th in the % of shots coming from the central part of the penalty area and 4th in expected goals for. There’s a bunch more numbers you could pile through and it would turn out in a similar fashion, ranking Inter’s attack as a respectable team but nothing special. The manner in which they’ve attained this is fascinating. In an era where team attacking movements have never been more intricate, Inter are an outlier with their attacking approach oriented on athletic ability. They’ve switched between multiple formations: a 4-3-2-1, 3-5-2, 4-3-3, 4-4-2 and recently Roberto Mancini has preferred a double pivot within the 4-2-3-1 formation. The depths of which Inter’s formations have changed has reflected the constant search for a workable formula. So far it hasn’t mattered. They sit top of Serie A. But you get the feeling that the club at times is living on borrowed time with their over reliance on defense, especially in close game situations. The most striking thing about Inter’s attack is the frantic tempo; constantly looking for passes into their attacking players. Most of the central midfielders that Inter have are broadly classified as athletic ball recyclers with the likes of Felipe Melo, Geoffrey Kondogbia and Gary Medel. As a result, teams have often gone to man marking Inter’s central midfield which has forced either the double pivot or the three man midfield to do one of two things: either make a rudimentary pass to a teammate around them or transition the ball quickly to one of the attacking players. The central midfielders are all fairly uncomfortable against the press, meaning the full-backs most remain slightly deeper to create an easier passing option should they come under any serious pressure. This makes it more difficult to release the full backs into advanced areas. Inter can still occasionally get their fullbacks into advanced areas, particularly Alex Telles. But this occurs when they play 1v2 with a wide player, or they collect the ball in a non structured situation and advance it high up the pitch. As a result, Inter have a tough time creating attacks from the back. When teams don’t pressure Inter’s backline, it can look sometimes that they’re bereft of ideas on how to build play from deep. This often leads to ponderous passing and the occasional ambitious long ball from their centerbacks. It gets even more worrisome when the opposition are pressing Inter. Udinese, and at times Fiorentina, pressured against Inter and it caused them to play on the back foot. During the initial stages of the Napoli match, even when Napoli were up 1-0 they hurried the Inter backline. Nagatomo was particularly targeted, and this forced Inter to retreat back to Samir Handanovic using him as a release valve to restart their attack. Inter’s poor build-up structure and Napoli’s poor press force Murillo into a difficult situation. He has three main options: pass it back to his GK, make a near-suicidal pass to a teammate in the midfield, or hoof it as far as possible. Very little of the Inter attack goes through the central midfield, and when it does, it’s often forcing the attacking players to receive the ball much deeper than they would like to. It makes sense to get your best players on the ball as much as possible, but the attacking players are much less dangerous when being asked to collect the ball in the midfield with their backs to goal. When Inter deviate from playing redundant midfield players and instead use Brozovic, they trade defense structure for a bit of offensive spontaneity. Brozovic is a talented dribbler who can get himself out of tight situations with his light feet and in one smooth motion can either pick out a pass to an attacking player, or create the pass that creates an opportunity for a teammate to advance play. This suggests the best midfield going forward would be utilising Brozovic in a double pivot alongside one of the many destroyers. Geoffrey Kondogbia, for example, thrived last season at Monaco alongside creative midfielders, but has struggled this year in a midfield full of mostly redundant pieces. Upon transitioning into the opposition half, Inter’s attacking play is largely based on individualism. The likes of Ljajic, Perisic and Jovetic are adept at receiving the ball in somewhat unconventional areas and quickly putting pressure on the opposition with either a pass or dribble. At its best it’s an efficient way of bypassing their weaknesses in the midfield and producing good scoring chances, particularly when the attacking move involve striker Mauro Icardi. Their only goal versus Lazio symbolized that. This is Inter at their best: a quick tempo involving a defensive action -> quick pass to the attacking three -> ball into Icardi. It’s everything that Roberto Mancini wants Inter to be with the roster he’s accumulated. However, strip out those moments and you find an attack that is often stagnated. It’s the consequences of relying on individualism to paper over the cracks. When the killer passes aren’t available, Inter will still try and force them in and meekly secede possession. Inter also have a penchant for long range shots when things don’t go their way with the club ranking in Serie A’s top 6 in shots from outside the area. And here’s the big kicker, the attacking structure that Inter have built has come at the expense of their talisman goal scorer Mauro Icardi. Icardi has been dying for service this season. He’s been receiving the ball about as little as a striker of his caliber can and it’s easy to see why. Inter have built an attack that is the antithesis of a poaching striker. Numerous Inter build up plays in the final third involve overloading on either side and a gap in the central area. When that happens, often times there’s little support for Icardi in the areas that a #10 would generally occupy. This means Inter often rely on 30/35 yard passes to create a chance for Icardi. In theory, a permanent switch to the 4-2-3-1 should help rectify these type of situations going forward. There’ll be times when Icardi will communicate to those around him that he is available for a ground pass, but yet no one will provide him the ball. Even though Jovetic wears the #10 on Inter, he doesn’t play as a nominal #10. He moves around all over the place and occupies different positions playing at times; sometimes like a wide player and at times like a second striker. That type of versatility is needed considering the one dimensional nature of the central midfield, but it can come at the expense of building a consistent rapport with Icardi. He’s also quite happy to let fly outside the box shots if he doesn’t sense anything happening around him. The 4-0 victory against Frosninone in late November was arguably Inter’s best attacking performance. Three of the goals that came in the second half were created from some beautiful team passing and hinted at what Inter could be if they get their attack going. Ljajic’s role in particular was important because he did the brunt work of the creativity on that night, occupied the #10 areas that Icardi can get service from and generally stayed attached to him. He played a nice 1-2 with him which led to a tap in for Icardi. Jovetic was also more consistent when playing closer to Ljajic, and although his touches were still spread out, there was more of an emphasis on being closer to Icardi for link up opportunities. After 17 games, Inter’s attack can be best described as still a work in progress. To their credit they have been ruthless in capitalizing on defensive errors and turning them into goals. Their 4-0 victory over Udinese was a testament to that, as they scored three of their goals from defensive errors by the Udinese backline. Inter are blessed with a couple of hyperactive creative midfielders in Ljajic and Jovetic, while Icardi has still managed to score goals at an impressive rate despite being much more of a supporting player than the main focal point offensively. It’s probably fair to say that the offense still being this choppy is a bit of a concern despite having no European football to deal with, but it’s also fair to say the massive roster upheaval Inter had over the summer means this shouldn’t be a surprise. The Frosinone performance showed a road map that Inter could head down and find attacking success, but this level of performance needs to be attained against teams with a sturdier defense. In an era where a lot of teams are zigging, Inter are zagging. If the club can find more cohesion going forward, we might be looking at the first Scudetto for Inter since the treble winning season six seasons ago. Massimo Allegri lined his team up in a 4-3-1-2 basic shape. A salida lavolpiana in Juventus’ deep build-up means the central defensive duo, Giorgio Chiellini & Andrea Barzagli, shifted wide and let the central midfielder, either Marchisio or Pogba, collect the ball from Buffon. Stephane Lichtsteiner and Patrice Evra were played as the wing backs. In the midfield, Stefano Sturaro and Hernanes played, respectively, as the right 8 and 10. Paulo Dybala was paired with Mario Mandzukic up front. Juventus, as often, attempted to overload the flanks. The focus on the ball-side area was strong and their horizontal shifting enabled them to have a numerical overload at all times. They often established an overloading that consisted of 6 players which managed to trouble AC Milan’s wide attacks. Despite their good shifting, there was actually an issue within this phase of play. Juventus – or maybe Hernanes himself – often defended in a 4-3-2-1/4-3-1-2 basic shape, with Hernanes staying slightly higher then the three midfielders. This potentially gave Milan better penetration if their midfielders were more vertical. However, this advantage was rarely utilised. An illustration of Juventus’ occasionally poorly structured press. Juventus shifting was ruined by the positioning of Milan forward trio as they engaged Juventus defenders. When Romagnoli found the space, he made a forward pass which was picked up by Niang. Hernanes’ positioning also played its own part in the lack of spatial compactness within this Juventus press. AC Milan fielded a 4-3-3/4-5-1 formation, with the two ‘wide’ forwards positioning themselves in central zones rather than keeping the width. The front line was filled by Carlos Bacca in the middle, flanked by Alessio Cerci on the right and M’Baye Niang on the left. Juraj Kucka, Ricardo Montolivo, and Giacomo Bonaventura occupied the midfield and in defense, there were Ignazio Abate, Luca Antonelli, Alex, and Alessio Romagnoli. In their defensive phase, AC Milan displayed a high-block defense, trying to press Juventus’ deep build-up. In this phase, Milan were focusing on both of Juventus’ central defenders, using them as the orientation of their first wave press. If Juventus managed to bypass this initial press and progress up the pitch, Milan adapted and transformed into a 4-5-1. Here we can see that Juventus tried to exploit the space between the lines; Hernanes or Paulo Dybala occupied the area as they were expected to be the vertical access of Juventus’ progression. Alex was tasked to man-mark Dybala, so it was him to defend against the Juventus striker, meaning he had to step forward. This led to space behind him. On some occasions, this Alex defensive movement gave Juventus some potential space to move into. One such example occurred in the first half, when Hernanes occupied the space in front of Alex and received a pass. As Milan midfielders failed to stop it and relied on their backward shifting for an intense press would never be a wise decision, Alex had to move out to deal with Hernanes. This created the opportunity for Dybala to get into the space vacated by Alex. Fortunately for Milan, Juventus didn’t capitalize on this opportunity. On the other hand, the inverted wide forwards within Milan’s defensive formation often proved to be crucial centrally. They helped to create a 4v3 or 4v2 in the central area, stopped the attack as well as builing a more compact shape in case of any immediate counterpressing. The change, Alex Sandro coming on to replace Patrice Evra, started to take effect in the early minutes of the second-half. Alex Sandro’s verticality was useful as Juventus needed to stretch Milan out wide. He often found moving forward quickly and occupied the potential area for counter-attack. This change which positively-impact on Juventus attack was actually also influenced by the formation change. Juventus now were lined-up in a three central defenders, means their both wing back were given more license to push further forward. The only goal scored by Dybala was a perfect example: a pass from Paul Pogba to the onrushing wing-back ended-up with an assist for Dybala’s goal. In attack Juventus were more of a 3-5-2, but transformed into a 5-3-2 or even a swing 4-4-2 without the ball, as one of the wing backs was deeper to the other, depending on the position of the ball. With three dedicated central midfielders and two wide-men, Juve were able to focus to the central area which gave some good support for their counterpressing. In the second-half, Juventus also played with a more direct style in possession. Milan themselves didn’t seem to change their tactic drastically. Against the ball, in a settled defensive-phase, they utilised an asymmetric 4-3-3/4-3-1-2, but he elementary issue was still there: the spatial compactness. Paulo Dybala and occasionally Paul Pogba, moved into the space between the lines, acting as Juventus’ primary outlet for circulating possession into the final third. In attacking phases, Milan found it difficult as Juventus pressed them high-up the pitch which forced them to use a lot of long passing play. The other issue here was Juventus managing to isolate the striker, the passing target, as they formed a good shape to deal with not just the long ball, but also the long ball if Bacca was able to make a positive first touch. From such scheme, Juventus created the opportunity for a counter-attack. And as aforementioned, the presence of Juventus’ wing backs had been an important factor for them throughout the second half, being a valuable outlet in counter attacks. The role of these wing backs was to ensure they were available for a pass from the central defenders immediately, and with space to move forward into, they were easily able to progress play. As they had the lead, Juventus were more comfortable with their defensive play. The involvement of their attackers was another key factor, as has often been the case during the Allegri era. In this phase of play, Juventus were in more of a 5-3-2/5-4-1 shape, with Dybala dropping even deeper and leaving Mandzukic alone forward. Milan needed to push the equalizer, and this had an effect on their defensive playy. With Juventus lined up in a defensive three, Milan would use a man-oriented press, with the three Milan forwards each marking a Juventus CB. This was largely unsuccessful, as Juventus’ central defenders on the pitch were all capable of playing out of an opposition press. When Juventus beat Milan’s initial press, there was always the chance for Juventus to create numerical superiority in the second-line and quickly progress play. Once again the forward exhibited his capability of playing at a high level. Dybala dropped deep, picked up the ball, created play, and pressed the opponent with proper gesture and positioning. On some occasions, some of his decision making could have been improved, as he often chose to pass the ball into a less strategically advantageous zone. But, of course, he has shown us how important he is within Juventus’ tactic. More playing minutes, more experience, and Dybala arguably becomes the prime protagonista for Juventus. Both teams had difficulty creating valuable chances, and this created a drab match. With this win, Juventus moved up to 6th place and 9 points behind the league leader, Inter Milan. This Wednesday, Juventus will host their important Champions League clash against Manchester City. They have already shown the defensive ability to trouble Man City, but without better final-third penetration it will be hard for Juventus to collect all three points from Manuel Pellegrini’s team. PSG and Saint Etienne at the Parc De Princes was an intriguing matchup between the huge Ligue 1 favorites and a team that some believe could challenge for a Champions League spot. PSG are a juggernaut but Saint Etienne are also an interesting team. They have taken the mantle from Marseille as perhaps the most aggressive pressing team in France. Of course, their pressing isn’t as frenetic as the Marseille side under Marcelo Bielsa, but it’s quite intense in its own right. With the attacking talent at hand for PSG, utilising that style of play was audacious from Saint Etienne manager Christophe Galtier. It was the same standard 4-3-3 for PSG but with minor alterations. Layvin Kurzawa and Gregory Van Der Wiel came in at full backs and provided a lot of speed at their position compared to the likes of Maxwell that usually starts for PSG. Adrien Rabiot played instead of Blaise Matuidi for squad rotation purposes. Saint Etienne this season have shifted back to a 4-2-3-1 formation after playing primarily in a 4-3-3 formation to make up for a natural #10 on last season’s team and basing their attack on their wingers. 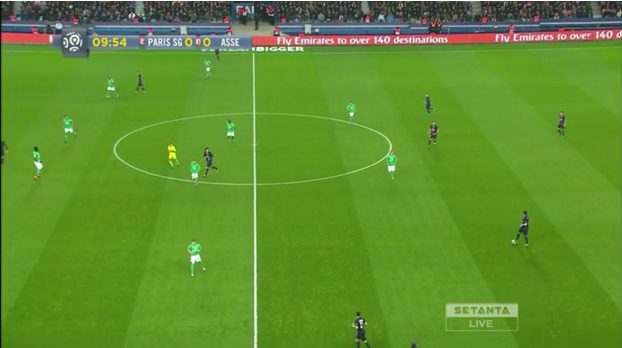 In many ways, Saint Etienne utilised a very similar gameplan against PSG to the one Marseille used a few weeks ago. ASSE tried to play primarily through the counter and press either when they lost the ball or just got tired of PSG passing between their centerbacks. In comparison to Marseille who mixed their use of pressing, Saint Etienne were more gung-ho about it. In rare instances, Saint Etienne would choose to play a conservative 4-4-2 defensively. Saint Etienne were appalling going forward, creating very little offensively. 12 of their 14 shots were outside the penalty area and PSG suffocated any attempts of Saint Etienne creating any half decent chances. Just like with Michy Batshuayi, Robert Beric was isolated very often and used as an outlet for Saint Etienne when they wanted to establish possession. The problem was that when Marseille did similar things with Batshuayi, they would follow it up with actions that were quicker tempo; whether it would be Batshuayi trying to run in behind the centerbacks of PSG or Marseille’s wingers trying 1v1 in an attempt to create quick offense. Saint Etienne did very little of this. Saint Etienne’s passing was non existent and the one time they had a quick combination passing sequence, it netted them their best chance which was an effort from Valentine Eysseric in the 14th minute outside the box that nearly curled in past Kevin Trapp. PSG deserve credit for Saint Etienne’s attacking woes. PSG gave little to no room for Saint Etienne to work with, and without the individual talent to create something out of nothing, it left Saint Etienne grasping at straws. When PSG weren’t pressuring Saint Etienne after losing the ball, they were willing to drop back slightly and suffocate the space in their own third. And when Saint Etienne tried to hit PSG on the counter, PSG tracked back and snuffed out any danger. When Real Madrid won its 10th CL title two seasons ago, one of the biggest reasons for their success was that they converted Angel Di Maria into an inside midfielder who would make lambasting runs through the middle. It created a welcome dimension for that Madrid side and it paid dividends in the CL final where Di Maria played a huge role in the Gareth Bale game winner in extra time. PSG haven’t completely gone the same way with Di Maria, and they may never do what Real Madrid did with Di Maria, but Sunday hinted at the type of damage he could do if allowed to roam in centrally more consistently. We saw signs of it when PSG destroyed Monaco two months ago on Di Maria’s debut for the club including an audacious long ball onto Lavezzi for the third goal in their 3-0 victory. Outside of that, Di Maria has played more or less as your average inverted winger who gets to cut inside with his stronger left foot. Against Saint Etienne though, it was more the Real Madrid Di Maria that we saw. Though he did play quite a fair bit out wide, he also was allowed to drift inside and almost make it a four man midfield with Cavani as a left forward and Ibrahimovic as a #10/ST. Van Der Wiel’s bombing up and down the right side allowed Di Maria to come in centrally. The third goal in particular was Di Maria at his best, a wonderful throughball to Cavani that led to a tap in for Ibrahimovic. Performances like this from Di Maria may lead to PSG playing a three man midfield featuring Marco Verratti/Blaise Matuidi/Di Maria, which would arguably be the most dynamic midfield in Europe. Matuidi could make up for Di Maria when he doesn’t fully track back, and it could take advantage of both Verratti and Di Maria’s outstanding ability to create throughball opportunities and PSG have Lucas on the bench so a 4-3-3 formation would still be possible. At the very least, it’s a lineup that could be used domestically without too many repercussions considering the talent at hand. Pressing against a team as ball dominant as PSG has been attempted before in Ligue 1 recently. Lyon last season in their two 1-1 draws against PSG pressed with the front three of Nabil Fekir, Clinton N’Jie and Alexandre Lacazette. Marseille famously tried an intense man-marking version of pressing against PSG last season and in the second Le Classique last April, it got them a 2-1 lead after 45 minutes in perhaps the biggest game of Ligue 1 last season. With a team like Saint Etienne who don’t have well-renowned offensive talent, using it as a way to create opportunities was a logical idea and if executed properly could lead to maybe 1-2 big chances in open play. The problem was that it didn’t work for Saint Etienne on two levels. Firstly, their attempt to create a high tempo defensively didn’t frustrate PSG and it didn’t even create chances for themselves in attack. The warning signs were there early on for Saint Etienne. An 10th minute long ball into Ibrahimovic bypassed the Saint Etienne backline with ease and nearly put him on a breakaway. A younger Ibrahimovic would’ve gotten to this ball and had a key opportunity at goal. Saint Etienne’s backline were consistently trying to play the offside trap and PSG’s attacking trio all had their attempts at getting behind their defense. Two or three more times before the first goal, PSG played direct longballs from their own half, that on another day, could’ve ended up as grade A chances. 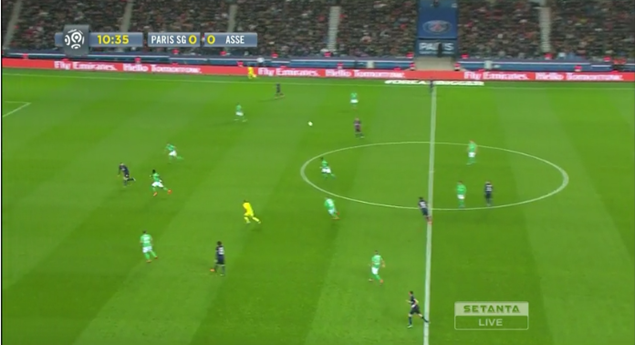 The first goal for PSG was a combination of great passing and half-hearted pressing on Saint Etienne’s part. 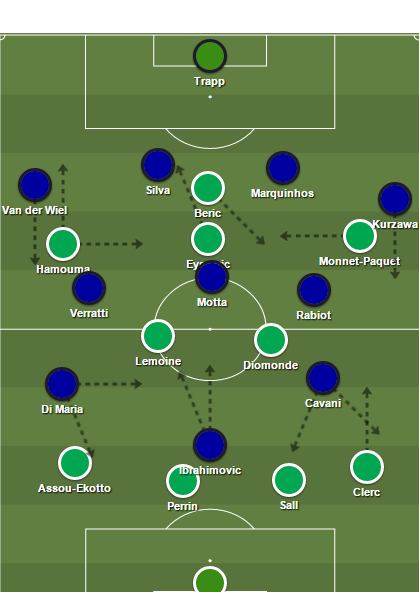 When Motta receives the ball, Saint Etienne could try and double team him and gamble they could dislodge the ball. Or alternatively they could’ve sat back a little and give Motta some room but try and take out his passing options. Instead, it was a faux-pressing action between the two players closest to Motta that allowed him to pass it to Rabiot and it eventually ended up in a Verratti throughball onto Kurzawa. It also didn’t help that Monnet-Paquet didn’t smell out the danger and track Kurzawa’s run and then Francois Clerc gave a poor attempt at tackling Kurzawa just before he got 1v1 with Ruffier. Again, it was great bit of passing from PSG and it was the type of movement and tempo that they can do on a consistent basis against any defense in France. But it was helped by Saint Etienne’s indecision. More of this happened in the second half when Saint Etienne continued to play a high line against PSG and repeatedly got burned. Di Maria was played in via a lovely back heel by Ibrahimovic and could’ve made it 2-0. For a team that has been known for its solidarity defensively over the past few seasons, Sunday night was one of Saint Etienne’s worst defensive performances under Galtier. Saint Etienne were awful against PSG on both facets. Defensively, they surrendered eight big chances against PSG and gave up an expected goal tally of 4.03, by far their worst number in a single game this season. Going forward they only had two shots in the penalty area and one big chance created. It was a case of having the right idea but a very low bar in terms of the execution at play. PSG picked apart Saint Etienne’s press and suffocated their attack when Saint Etienne tried to create. It was a poor display for a supposed CL contender in Saint Etienne and it showed just how limited they can be against top opposition, which they haven’t had too much of with their easy schedule so far this season. For PSG it was another further statement as to how far above they are talent wise over the rest of Ligue 1 which was already very well known, and it showed us a window into how PSG could incorporate Angel Di Maria centrally. His movement was excellent and his performance overall was reminiscent of his heyday at Real Madrid and even his first few performances with Manchester United. Zlatan Ibrahimovic had arguably his best game in months and it was a throwback performance, with his willingness to run in behind defenders along with his tendency to drop deep and play as a faux #10. It’s probably too much to ask of him to play like this a lot, but PSG don’t need him to. It was a very thorough demolition by PSG; the type of performance that shows why some people think of them as one of the top five teams in European football this season. Arsenal overcame Bayern Munich in a match few expected them to win. In a calculated tactical display, Arsene Wenger’s team sat deep and used impressive counter-attacks to cause Guardiola’s team a number of problems. There cannot be any doubts about the quality of Arsenal’s general co-ordination in the attacking organisation phase. But these are not skills that would be needed often against Bayern; this would be a completely new challenge. When Arsene Wenger’s team have been presented with these challenges previously, they have generally faltered. He has been accused of naivety, but his approach to the game against Bayern proved that Wenger is capable of altering his tactical approach should the situation demand. Bayern’s main threat, much like Arsenal, comes in the attacking organisation phase. And as a result, Arsenal would spend much of the game without possession. Their approach to dealing with this changed throughout the game.